These strange merchants ended up in Traverse Town like many others who managed to survive the destruction of their worlds. Some of them run the Synthesis Workshop at the First District where Sora can trade in items that they use as raw materials to make new creations. Word of advice, though: Don't ruffle their pompoms like Pinocchio does. Out of fear of another pompom ruffle, these adorable creatures opt instead to hang back at their home base while their equally cute holograms run the shops across the worlds. You can try to touch it, but don't be disappointed when your hand passes right through them! 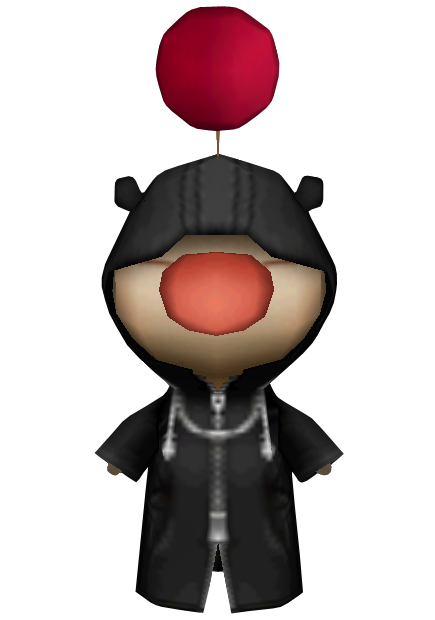 This slick Moogle merchant somehow managed to make his way into the Castle That Never Was, even wearing the signature Organization XIII coat, no less. Out of all the Organization's members, Roxas is undeniably his best customer, mainly because he is naïve enough to pay any ridiculous price he names. But, in turn, he always notifies Roxas whenever a new shipment of goods arrives in stock. (Wherever it is these items ship from is a complete mystery.) Because none of the other members would agree to his enormous fees, he follows Roxas to Twilight Town when he leaves the Organization, and continues to operate his shop from there. A small piece of trivia: When the Moogle and Roxas first meet, he tells him that his "name is of no importance, kupo," a parody of Xemnas' lines from the scene "The Dark Margin". If you're looking for goods, just head over to your local Moogle shop. They have all kinds of merchandise, but you would probably be most interested in deck commands. Most of the shops are run by holograms, except for the one at Radiant Garden. There's also a Moogle in Mirage Arena who runs a special "Medal Shop" where you can redeem various rewards in exchange for the medals you gain from the Arena games. Somehow these cuddly creatures have made their way into the Sleeping Worlds, but is that really a surprise at this point? Moogles are more than happy to assist you with all your item needs, but also run the Coliseum in the fourth district of Traverse Town.